V Piñeiro-Naval, P Serra, R Mangana (2017): “Local development and tourism. The socio-economic impact of digital communication in Portugal”. Revista Latina de Comunicación Social, 72, pp. 1.515 to 1.535. Introduction. This article presents the results of a study that examines the tourist information offered by Portuguese municipal websites and correlates it with certain structural factors to measure the impact of the leisure industry on local development. Methods. Content analysis, based on a codebook of 36 variables, was performed, with a predictive character, over the 308 websites that make up the total population of Portuguese municipalities. Results. At the general level, the tourist orientation of the Portuguese municipal websites is relatively clear and explicit, particularly in the municipalities of the coast of Continental Portugal. Conclusions. The study has confirmed a trend change in tourism, towards a more sustainable non-seasonal model that is based on cultural and natural heritage. In addition, and in line with pre-existing literature, it has been shown that demographic and economic factors are determinant for the state of the management of municipal websites. Tourist information; e-government; local development; socio-economic indicators; Portugal; web content analysis. 1. Introduction. 1.1. Tourism and ICTs: a symbiotic relationship. 1.2. Determining factors in web development at the local level. 2. Methods. 2.1. Sample and codebook. 2.2. Coding and reliability test. 2.3. Tourist Information Indicator. 3. Results. 4. Conclusions and discussion. 5. Notes. 6. References. 7. Annex: Outline of study codebook. From a strictly economic standpoint, “tourism is the second most important global sector, after financial services, and one of the fastest growing service industry for many economies in the world” (Alberti and Giusti, 2012, p. 264). In line with this observation, Túñez-López, Altamirano and Valarezo (2016) point out that “tourism is an evolving and dynamic activity that is easily adapted to social, political and economic changes. Its impact on the development of countries is evident, and that is why it has become one of the pillars of the world economy” (p. 250). To ratify these considerations, the World Tourism Organisation (2017), one of the main reference institutions in the sector, considers that the leisure industry represents, roughly, 10% of the gross world product; and, at the labour level, 9.6% of all jobs created (World Travel & Tourism Council, 2017). In 2016, and according to the Bank of Portugal, tourism revenue in the country amounted to nearly 12,680 million euros , which represents 9.2% of the GDP and the national employment (oecd, 2016). Without a doubt, these figures reinforce the role of this activity in overcoming a financial crisis that has severely affected the socio-economic fabric of Portugal, whose rate of unemployment in late 2016 was 11.1% . Thus, in Portugal, as in its neighbouring countries (Spain, France, Italy and Greece), the tourism sector strongly contributes to the wellbeing of institutions, companies and workers who, directly or indirectly, benefit from it. On the other hand, today there is a vast range of services available to tourists, including two antagonistic models: mass tourism and alternative tourism. The former model, commonly known as sea, sand and sun tourism, has hegemonized the most traditional and rooted tourism practices since the 1960s. It is a seasonal model and, consequently, depends on a key factor: weather. It also involves the consumption by the traveller of a set of hedonic and fleeting goods and services. In addition, this type of tourism has recently faced some phobia from some sectors of the destination’s population, who are unhappy with the negative consequences of the system: tourist saturation and physical deterioration of natural, cultural and urban spaces. However, authors such as Hernández-Mogollón, Campón-Cerro and Alves (2011) warn us that this trend has changed gradually: “while sun and beach tourism has stagnated in recent years as it has reached maturity as a product, other kinds of tourism have started to develop” (p. 34). And it is here where alternative tourism bursts, vigorously. This latter type of tourism is defined by Ibáñez and Rodríguez-Villalobos (2012) as “a stream of tourism focused on travels where tourists participate in recreational activities in contact with the nature and cultural expressions of indigenous, rural and urban communities, while respecting the natural, cultural and historic heritage of the destination” (p. 18). Faced with the saturation of mass tourism, it seems necessary to promote the development of other services based on heritage, both cultural and natural, with the consequent expansion of the industry and the economic advancement not only of countries, as wholes, but also of the regions and municipalities that comprise them. Not in vain, Richards (2016) warns that “the local population living in the places visited by tourists has become an essential element in the process of creating and marketing the destination. Locals are no longer a passive backdrop (that adds “local colour” to tourist environments) and have become one of the destination’s attractions” (p. 74). In this way, the benefits derived from the activity contribute directly to the broader levels of society. The role played in recent years by the information and communication technologies (ICTs) and, more specifically, the Internet in the development of the leisure industry has been crucial. Jiménez and San Eugenio (2009) argue that “the marketing of tourism products, destinations and services is, basically, based on the deployment of various communication processes, which have experienced major trend changes” (p. 290). These changes have been generated largely by ICTs, which represent “a transverse axis for the development of tourism and, therefore, are indispensable tools for the promotion and dissemination of tourist destinations” (Túñez-López, Altamirano and Valarezo, 2016, p. 251). For his part, Moragas (2015) highlights one of the multiple potential benefits ICTs offer to municipal corporations: the construction of “a great informational structure capable of covering all topics, spaces and actors of the city; from its history and heritage to its more trivial accommodation and catering information” (p. 79). Thus, and in a local context, “there is a sender who, consciously or unconsciously, creates a certain image of a place. It acts as an antenna that transmits concepts, attributes, values, impressions, scents and visual elements that make up the image of a space” (Jiménez and San Eugenio, 2009, p. 287). Through their websites, local councils, provincial councils and regional tourism promotion agencies try to (or should) attract potential visitors through the promotion of a suggestive cultural and leisure offer. In other words, websites “are tools that help tourist destination managers to attract tourists to their localities, either through the provision of information, the establishment of dialogue between the parties concerned or the systematisation of the supply of tourist services, including access and links to hotels and tour operators” (Alencar et al., 2011, p. 1348). Although they are not specifically focused on the content analysis of local websites, studies like those carried out by Fernández-Cavia et al. (2017) and Míguez-González and Fernández-Cavia (2015) contribute to the contextualisation of the research related to ICT and tourism in Spain. The first of these works (Fernández-Cavia et al., 2017) aimed to study the online communication strategies of destinations by means of a survey addressed to their managers, and concluded that branding is not yet fully standardised or professionalised. 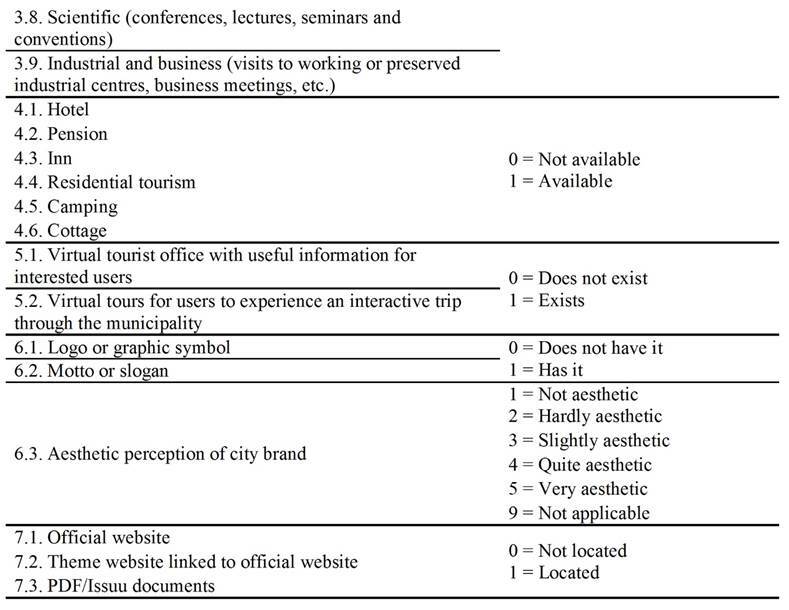 On the other hand, Míguez-González and Fernández-Cavia (2015) evaluated the interactive and social dimensions of a sample of 87 official destination websites, and pointed out that they show a clear orientation towards interactivity. At an academic level, Standing, Tang-Taye and Boyer (2014) performed content analysis on 288 articles that were extracted from 18 journals published from 2001 to 2010 and examined the relationship between tourism and internet. They catalogued the works according to thematic categories, including: information search (25.69%), website design evaluation (19.44%), tourism marketing (18.06%), e-commerce (16.32%) and online service buying (15.97%). In this respect, it is possible to observe that the primary theme has to do with the information dimension of the web in tourist terms, since over a quarter of the analysed works focused on that aspect, which proves the relevance granted, also by the academia, to this web parameter. Finally, it is important to add that “the development of ICTs and particularly the Internet empowered the ‘new’ tourist who is becoming knowledgeable and is seeking exceptional value for money and time. They are less interested in following the crowds in packaged tours and much more keen to pursue their own preferences and schedules” (Buhalis and Law, 2008, pp. 610-611). Urry and Larsen (2011) express the same idea when confirming “the tourist gaze is directed to features of landscape and townscape which separate them off from everyday experience. Such aspects are viewed because they are taken to be in some sense out of the ordinary” (p. 4). In short, the tourism industry has experienced an explosion of such magnitude in the last decade that it has been placed in a prominent position in the socio-economic fabric of many countries. This transformation is due to various factors, including two that appear to have a special significance: the increase of supply and the diversification of tourist services (with cultural and natural tourism models as the main “adversaries” of mass tourism), as well as the management of ICT and internet in the strategic promotion of destinations, which allows tourists, who are ICT users, to plan their trips and select their ludic experiences independently, according to their own interests and motivations. This is the case of Portugal, which is the object of this study and, at the same time, can be compared to other adjacent realities (for example: Spain, France, Italy and Greece). Based on the previous scientific literature, it is possible to assert that there are two structural factors with a key impact on the development of municipal interactive services: the population size and the economy of the locations. This has been confirmed by the studies carried out by Moon and Norris (2005), who claim that large cities are more inclined to digital practices than small cities, given that the former receive more pressure to find ways to supply public services and disseminate information among their audiences. Huang (2006), for his part, performed content analysis on a wide sample of 1,744 local American websites based on 36 dichotomous variables, grouped in domains such as: information, communication, transactions and e-democracy. Huang aimed to determine the implementation level of the different guidelines and initiatives related to e-government, and concluded that this level correlates significantly with of the municipalities’ population and income. Gandía and Archidona (2008) examined 130 websites of Spanish municipalities with over 50,000 inhabitants based on 88 items divided in 5 thematic groups (general information, budget information, financial information, navigation and presentation, and relational web). These authors tested a series of hypotheses correlating external macro-statistic data (political competitiveness, municipal wealth, education level and household internet access) with data from their own analysis, which are condensed in the Web Quality Model (QWM) indicator. Based on a thorough statistical treatment of the data, they confirmed that: the greater political competition, municipal wealth, education level and household internet access, the more information is disseminated by municipalities through their websites and, therefore, greater QWM scores. In the same way, it is convenient to mention the study carried out by Gallego-Álvarez, Rodríguez-Domínguez and García-Sánchez (2010), which reviewed key external elements to predict the state of the websites of a sample of 81 municipalities from across the world. This analysis is based on 98 items divided in 5 dimensions: security and privacy, usability, content, service and civic participation. They concluded that the state of e-government “requires the building of a technical and administrative infrastructure that enables its development. In this sense, the budget of the public body may constitute an important determinant for implementing e-government practices” (Gallego-Álvarez, Rodríguez-Domínguez and García-Sánchez, 2010, p. 425). In a national context, like the case of Lithuania, Gaule and Zilinskas (2013) correlate data from an institutional study on the state of the municipal websites in the country (60 in total) with external macro-statistical political, economic, geographical, cultural and social data. The conclusion was that the richer and the more populated the municipalities, the better the implementation of their services on the internet. Focusing on the Portuguese case, Dias and Costa (2013) also performed a predictive web content analysis of the population of municipal websites in Portugal. In it, they used a dozen of dichotomous variables (divided into government information, e-services and citizen participation) to test the development level of the local Portuguese administration. These authors say that the Portuguese councils act as “the closest point of contact with citizens. Their main attributions relate to the management of the territory. Other functions include economic development, public infrastructures and education” (Dias and Costa, 2013, pp. 287-288). In addition, they maintain that “geographically, the highest e-government maturities are observed in the coastal municipalities, which are the most populous and, simultaneously, have generically the best socio-economic indicators” (Dias and Costa, 2013, p. 305). Despite not being focused specifically in the tourism sector, the previous works empirically demonstrate that the paradigmatic factors that determine the development of local interactive services are the population size and economy of the municipalities. Based on this approach, and in the absence of studies devoted to this phenomenon, this article aims to examine the relation between the tourist information of the websites and structural factors, to measure their impact on local development. The following section describes the objectives of the study. In general terms and as mentioned in previous paragraphs, this study examines the tourist information published in the municipal websites of Portugal. 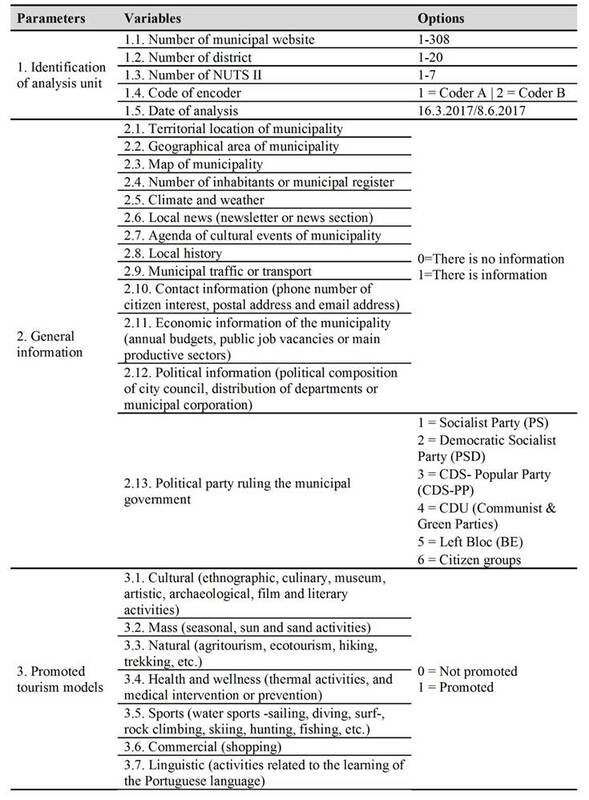 The particular objectives of this work are: measure, in accordance with the purpose-created Tourist Information Indicator (TII), the level of tourist information of the councils; determine the types of tourism promoted the most at the local level and the association that can be established among them; make demographic, geographic, regional and ideological comparisons to identify differences, if any; and, finally, identify macro-economic variables that can be predicted according to the websites’ degree of tourist information. From a methodological point of view, the technique used to achieve the objectives was content analysis. Herring (2010) points out that “its most prototypical uses have been the analysis of written mass media content carried out by scholars of advertising, communication, and journalism. However, in recent decades, content analysis techniques have also been used increasingly to analyze content on the Internet” (p. 234). The requirements of the protocol stipulated for its application in web environments (McMillan, 2000; Sjøvaag and Stavelin, 2012; Weare and Lin, 2000) range from the formulation of questions and hypotheses to the interpretation of the data obtained; that is, to draw final conclusions from the empirical work. The intermediate stages, such as sample selection, definition of categories of analysis, coding, reliability testing and data exploitation, will be addressed in subsequent sections. • RQ1: What kind of information is made available in the websites of the municipalities of Portugal from the tourist point of view? • RQ2: What types of tourist practices are more predominant and how are they associated with each other? • h1: As the promotion of cultural tourism increases, the promotion of commercial tourism also increases. • RQ3: What is the specific degree of information according to the purpose-created TII? • RQ4: Taking the TII as reference, and according to the geographical, regional and ideological criteria, are there any differences between the municipalities? • h2: The municipalities with the largest populations will have highest scores in the TII. • h3: The greater the TII score of the websites, the greater the wealth of the municipality. • h3a: Greater TII is correlated with greater municipal budget. • h3b: Greater TII is correlated with higher income per capita of citizens. • h3c: Greater TII is correlated with greater purchasing power of citizens. • h3d: Greater TII is correlated with greater spending capacity of the council in cultural activities and leisure. The necessary statistical data to carry out the comparisons with the TII, which gives a predictive capacity to web content analysis (Piñeiro-Naval, Igartua and Sánchez-Nuevo, 2017), have been extracted from the web directories of Portugal’s National Statistics Institute (Instituto Nacional de Estatística: www.ine.pt), Portugal’s Contemporary Database (Base de Dados Portugal Contemporâneo: www.pordata.pt) and Portugal’s Directorate General of Local authorities (Direção Geral das Autarquias Locais: www.portalautarquico.pt). According to Keith, Schwalbe and Silcock (2010), “one of the first concerns of any content analysis project is sampling” (p. 90). When working with web-content, a typically chaotic and disorganised medium (Kautsky and Widholm, 2008), the design of representative samples is a challenge for researchers (Riffe, Lacy and Fico, 2014). However, for this research it was not necessary to select a representative sample, since the whole population of Portuguese municipal websites was examined: n = 308 websites. The codebook, on the other hand, is the indispensable tool in any content analysis, as it outlines the coding instructions and the study variables (Igartua, 2006). In this sense, Neuendorf (2002) underlines that “the goal in creating codebooks and coding forms is to make the set so complete and unambiguous as to almost eliminate the individual differences among coders” (p. 132). Therefore, the codebook created for this study is composed of 36 items (see Annex) based on previous research in the field (Bastida and Huan, 2014; Córdova-Morán and Freixa, 2017; Correa and Nakamura, 2016; del Vasto-Terrientes et al., 2015; Diaz-Luque and López-Catalán, 2012; Fernández-Cavia and Castro, 2015; Fernández-Cavia et al., 2014; Fernández-Cavia and Huertas, 2009; Ibáñez and Rodríguez-Villalobos, 2012; Piñeiro-Naval, Igartua and Rodríguez-de-Dios, 2015; Šifta, 2016; Túñez-López, Altamirano and Valarezo, 2016; Yang 2016). They refer mainly to general tourist information, types of tourism promoted by municipalities, accommodation and use of city brand. With regards to the review of the websites, it should be noted that the coded information was found in their pages or in the tourist websites linked to the official websites. Based on this premise, and although the distinction is interesting (as it will be shown later), institutional and thematic websites will constitute a single unit of analysis. Similarly, for the identification of certain types of non-explicit tourism promotion (namely: cultural, natural and mass tourism), encoders should infer its existence based on the presence of the cultural or natural elements associated to those tourist practices. Two methodologically trained evaluators were responsible for encoding the sample, which began on 16 March and ended on 8 June 2017. Given the importance of standardising the conditions of analysis, we used only one browser (Google Chrome), identical computers and the internet connection available in the LabCom.IFP, where the research work was carried out. To calculate the reliability of inter-codifiers, a random subsample composed of 12% of the cases (n = 37 websites) was analysed by both members of the team. This vital part of the protocol was coordinated so that each website was simultaneously examined by the encoders to mitigate the volatility of the contents (Karlsson, 2012); which is an inherent trait of the internet that can affect the objectivity of the study if left out of control. The statistical test used for reliability was Krippendorff’s alpha, the more robust statistical test that best fits different scales of measurement as well as a varying number of encoders (Hayes and Krippendorff, 2007). The average reliability of the 36 variables of the codebook was satisfactory: mαk = 0.80 (dt = 0.16). The variable with the lowest reliability level was the promotion of industrial tourism (αk = 0.42), and thus must be interpreted with some caution. Before presenting the results, it is necessary to address the TII, which is a key factor in the strategy designed to exploit the data of the study. Weber (1994) maintains that in content analysis indicators often combine variables and acquire a descriptive power that is superior to that of separate variables. Based on this premise, and in order to provide added value to measure objectively the websites’ degree of tourist information, the following variables were added to measure the presence (or absence) of information about: municipality’s geographic location, map, register, geographical boundaries, climate and weather, local news, calendar of cultural events, local history, traffic and transport, contact information, promotion of different types of tourism (cultural, mass, natural, health, sports, commercial, linguistic, scientific and industrial), existence of online tourism offices and virtual tours, accommodation (hotel, pension, inn, cottage, camping and residence), elements of the city brand (logo and slogan) and, finally, the alternative location of the tourist information (documents in PDF-ISSUU formats and tourist website linked to the institutional website). These 31 variables are dummy variables, and for this reason the TII ranges from ‘0’ to ‘1’. Its internal consistency is: αc = 0.63; which is an acceptable value according to the minimum reference stipulated for exploratory studies: “0.60” (Hair et al., 2010; Robinson, Shaver and Wrightsman, 1991). Table 1. Percentage presence of study variables in the websites. Figure 1. Aesthetic perception of the city brand of Portuguese municipalities. Although the highest percentage corresponds to “quite aesthetic” (35.7%), the average level of perception of the city brand is reduced to mCityBrand = 2.55 (dt = 0.81). In this sense, we can assert that the real perception of the city brand of the municipalities is significantly lower than the theoretical average point (value 3) of the Likert scale in use [t (246) = –8.62; p < 0.001]. On the other hand, the correlation between the two encoders in terms of the allocation of values for this variable [r (35) = 0.98; p < 0.001] is very high. Table 2. Matrix of correlations between the different types of tourism that are promoted (Mathews correlation coefficient). Note: + p < 0.10; * p < 0.05; ** p < 0.01; *** p < 0.001. Based on the data, the highest correlations occur between the natural and sports models [rΦ (306) = 0.28; p < 0.001], mass and sports [rΦ (306) = 0.21; p < 0.001], and scientific and commercial [rΦ (306) = 0.21; p < 0.001]. In terms of the association between commercial and cultural tourism (h1), it is also statistically significant [rΦ (306) = 0.12; p = 0.034]. Regarding the TII (RQ3), the average for the sample is: mTII = 0.49 (dt = 0.11), with a range of values ranging from “0.06” to “0.77”. On the other hand, and taking the TII as reference, we have established a series of comparisons based on regional, geographical and ideological criteria (RQ4). Table 3. Average values of the TII across regions nuts II (anova). Note: Values marked with ‘a’ are significantly differentiated (p < 0.05). Based on the data presented in table 3 and the analysis of variance (anova), there are significant differences with regards to the averages of the TII according to region [FTII x NUTS (6. 301) = 2.19; p = 0.044; ɳ 2 = 0.042]. Scheffé’s method indicates that the most significant differences are established between the Metropolitan Area of Lisbon and the Autonomous Region of Azores [t (35) = 2.68; p = 0.011; d = 0.94]. The size of these differences can be considered ‘high’ (Cohen, 1988). A new analysis of variance (anova) allows us to assert the existence of significant differences with regards to the average values of the TII according to the geographical blocs [FTII x Blocks (2. 305) = 8.95; p < 0.001; ɳ 2 = 0.055]. 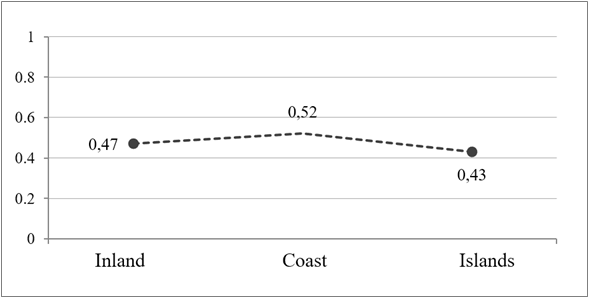 According to Dunnett’s T3 test, the most significant differences exist between the continental coast and the islands [t (181) = 3.60; p < 0.001; d = 0.68]. The size of these differences can be considered “medium” (Cohen, 1988). In political terms and thanks to the variable “Ruling Party”, was compared municipalities according to the left vs. right ideological dichotomy . Student's t-test indicates that there are no statistically significant differences between the local governments with different ideologies and the TII [t (306) = - 0.918; p = 0.359; d = -0.086], since the values of the municipalities governed by left-wing parties (mTII = 0.49; DT = 0.12) are almost identical to those of the municipalities governed by right-wing parties (mTII = 0.50; DT = 0.11). Figure 2. Average values of the TII according to geographical blocs (anova). Table 4. Average values of the TII according to the types of populations (anova). Note: Values marked with ‘a’ differ significantly (p < 0.05). Based on the data presented in Table 4 and another analysis of variance, we can confirm that there are statistically significant differences among populations according to the TII [FTII x Population (4. 303) = 3.30; p = 0.012; ɳ 2 = 0.042]. According to Dunnett’s T3 test, the most significant differences exist between small and large populations [t (120) = 3.16; p = 0.002; d = 0.724]. The size of these differences can be considered ‘medium’ (Cohen, 1988). Table 5. Association between predictor macro-statistical variables and the TII (Pearson’s correlation coefficient). Note: * p < 0.05; ** p < 0.01; *** p < 0.001. Source: Authors’ own creation. The data on Table 5 allow us to confirm the relationship between the TII and the municipality’s wealth (h3); which is a hypothesis that was subdivided into four others, which link the TII with the municipal budget [r (306) = 0.187; p < 0.001] (h3a), the per capita income of citizens [r (287) = 0.142; p = 0.016] (h3b), with their purchasing power [r (306) = 0.155; p = 0.006] (h3c) and, finally, the spending capacity of the council in cultural and leisure activities [r (306) = 0.123; p = 0.031] (h3d). Table 6. Relationship between the two possible locations of the tourist information (% column). -Statistically lower value (Analysis of adjusted standardised residuals). +Statistically greater value (Analysis of adjusted standardised residuals). Table 6, which correlates both options, allows us to confirm that there is a statistically significant association between the inclusion of tourist content on institutional and thematic websites [χ2 (1, n = 308) = 12.26, p < 0.001, v = 0.20]. In particular, 19% of the municipalities (n = 58), which place tourist information in their official websites, also operate some sort of thematic website linked to tourism. At a general level, we can confirm that the tourist orientation of the websites of Portugal municipalities is relatively clear and explicit. In this sense, and as one of the most remarkable findings of the study (consistent with the data obtained in Spain in previous studies), it is important to note that the two most successful manifestations of today’s alternative tourism, the cultural and natural sectors, attract greater prominence in the Portuguese local network, followed behind by the traditional mass model. This finding supports, from an empirical point of view, the trend experienced by the sector in recent years: the diversification of the offer to satisfy the growing and challenging demands of the new tourist, who seeks more enriching experiences at the vital level. Alberti and Giusti (2012) partially illustrate this trend when arguing that “cultural assets are crucial in attracting tourists to a specific destination, while tourism brings new and fresh resources to the cultural sector, spotting new entrepreneurial opportunities” (p. 264). First, society has to realise the value of heritage for the consolidation of peoples’ collective cultural identities. Territories, for their part, materialise the space where the dialectics between the native and foreign, self and foreign and local and global are reproduced. At the economic level, the tourism industry is a basic pillar for the balance of finances not only of countries as wholes, but also of the administrative units in which they are divided (municipalities and regions). However, the companies involved in the sector have to operate with responsibility to prevent, for instance, episodes that promote tourism-phobia among the local population. Finally, the political class which, through the promotion of legislative initiatives, must ensure the sustainability of the heritage so that future generations can also enjoy it, and get to know themselves as a social group (which would close the quadrature of the circle). On the other hand, delving into the types of tourism, the matrix of correlations allows us to confirm the logical and coherent convergence of various models. Thus, cultural tourism tends to be linked to trade, through which tourists acquire typical culinary and artisanal products that represent the intangible heritage of the destination. Sports tourism, for its part, complements mass and natural tourism, since in addition to the passive contemplation and enjoyment of coastal and inner landscapes, it allows tourists to practice sports in such geographical environments as added experiences. Finally, scientific and linguistic tourism are also significantly linked: to learning, science and knowledge. With regards to the city brand, Morgan and Huertas (2011) point out that “a place only becomes a destination through the narratives, images and brands communicated by the tourist promotional material” (p. 152). The truth is that, from a visual perspective, the image of cities (materialised in their logos and slogans) still has ample room for improvement. Carvalho and Moquete (2011) argue that “by recognising the importance of the image of the destination on the impact and survival of the tourist product on the market, tourist promoters direct their efforts towards the aggregation of value to the requested goods and services” (p. 446). Therefore, municipalities have to invest in the polishing of their image in order to promote their tourist offer in the most attractive way possible. An adequate presence in the Internet is essential if we want to promote any tourist destination. Particularly in the case of inland destinations, which seek to promote a type of tourism that has traditionally been neglected by the literature and is different from other more traditional offers (sun and beach tourism and urban and cultural tourism, among others) (Díaz-Luque and López-Catalán, 2012, p. 96). From a comparative point of view, the study has shown that the Metropolitan Area of Lisbon is the region that puts greater emphasis on the dissemination of its tourist information, and that the coast of Continental Portugal predominates at this level with respect to the inland and island municipalities. Consequently, the municipalities located in the latter geographical sectors must put all their efforts in promoting their tourist potentialities to the maximum to alleviate the differences that still exist across territories (Dias y Costa, 2013). On an ideological level, the results have confirmed that, regardless of the political party ruling the municipal council, the consideration given to the tourist information of the websites is the same. Therefore, the greater or lesser promotion of the recreational attractions of the municipalities does not depend much on the ideology of the ruling party but rather on population and economic issues. In line with the pre-existing literature, it has been shown that these two structural factors are crucial for the development of web services and that they also have an impact on the tourism industry of the municipalities. The results also demonstrated the predictive character of the TII (Tourist Information Indicator) designed specifically for the study because it correlated significantly enough with these variables to confirm the link between demography, economy and tourism in the internet. As an added circumstance revealed empirically by this study, it is interesting to note the proportion of municipalities that have some kind of web initiative linked exclusively to tourism: one of every five councils have invested in the development of a thematic website to give greater visibility to its tourist offer. This practice surely will be expanded in the coming years, as the people responsible for local agencies realise that investment is recovered, with guarantees, in the short or medium term. The methodological implications involved in this study can be summarised in two: the use of content analysis applied to web environments, which have been successful, and its correlational and predictive capacity, which also worked correctly. Therefore, it is estimated that the applicability of the assessment protocol described in this work to other local environments (in addition to the Spanish or Portuguese ones) can be performed to generalise the model and make it replicable in the international panorama. Finally, “tourism, holidaymaking and travel are more significant social phenomena than most commentators have considered” (Urry and Larsen, 2011, p. 3). We should not overlook the fact that “tourism matters because, in a world of confusing connections and disconnections between human beings, our lives with others matter” (Jack and Phipps, 2005, p. 1). This is why this study, based on “alternative tourism, digital universe and local development”, aims to shed light on this field and, at the same time, stimulate a debate that will continue generating theoretical reflections and empirical research at the heart of the social sciences. Information available at: http://www.portugal.gov.pt (20/08/2017). Information available at: http://www.pordata.pt (20/08/2017). To classify municipalities according to the ideology of the ruling party, the polychotomous variable «party» was transformed into a dichotomous variable called “government’s ideology”, whose values are: 1=Left and 2=Right. The left wing included the Socialist Party, the Communist and Green Party (a coalition) and independent Citizen Groups; while the right wing included the Social Democratic Party and the Popular Party. To determine homogeneous population types, the percentiles P20, P40, P60 and P80 were calculated from the “number of inhabitants in the municipality”, which resulted in the following demographic ranges: small municipalities (430–6,048 inhabitants), fairly small (6,049-10,761 inhabitants), medium (10,762-20,465 inhabitants), fairly large (20,466-47,760 inhabitants) and large (47,761-115,8269 inhabitants). Alberti, F. G., & Giusti, J. D. (2012): “Cultural heritage, tourism and regional competitiveness: The Motor Valley cluster”. City, Culture and Society, 3, 261-273. http://dx.doi.org/10.1016/j.ccs.2012.11.003. Bastida, U., & Huan, T. C. (2014): “Performance evaluation of tourism websites' information quality of four global destination brands: Beijing, Hong Kong, Shanghai, and Taipei”. Journal of Business Research, 67 (2), 167-170. http://dx.doi.org/10.1016/j.jbusres.2012.10.008. Buhalis, D., & Law, R. (2008): “Progress in information technology and tourism management: 20 years on and 10 years after the Internet - The State of eTourism Research”. Tourism Management, 29 (4), 609-623. http://dx.oi.org/10.1016/j.tourman.2008.01.005. Cohen, J. (1988): Statistical power analysis for the behavioral sciences (2nd ed.). Hillsdale, New Jersey: Lawrence Earlbaum Associates. Córdova-Morán, J., & Freixa, P. (2017): “Turismo, web 2.0 y comunicación Interactiva en américa latina. Buenas prácticas y tendencias”. International Journal of Information Systems and Tourism (IJIST), 2 (1), 17-34. Correa, C., & Nakamura, A. O. (2016): “Marketing online dos países do BRICS como e-destinos turísticos globais”. Revista TURyDES: Turismo y Desarrollo, 9 (21), en línea. http://www.eumed.net/rev/turydes/21/brics.html (último acceso: 15 de julio de 2017). Del Vasto-Terrientes, L., Fernández-Cavia, J., Huertas, A., Moreno, A., & Valls, A. (2015): “Official tourist destination websites: Hierarchical analysis and assessment with ELECTRE-III-H”. Tourism Management Perspectives, 15, 16-28. http://dx.doi.org/10.1016/j.tmp.2015.03.004. Dias, G. P., & Costa, M. (2013): “Significant socio-economic factors for local e-government development in Portugal”. Electronic Government, An International Journal, 10 (3-4), 284-309. http://dx.doi.org/10.1504/EG.2013.058785. Díaz-Luque, P., & López-Catalán, B. (2012): “La promoción turística oficial en Internet y su relación con el desarrollo turístico de los destinos: Una aplicación a las Ciudades medias de Andalucía”. Revista de Estudios Regionales, 93, 93-115. Fernández-Cavia, J., & Castro, D. (2015): “Communication and branding on national tourism websites”. Cuadernos.info, 37, 167-185. http://dx.doi.org/10.7764/cdi.37.682. Fernández-Cavia, J., & Huertas, A. (2009): “City Brands and their Communication through Web Sites: Identification of Problems and Proposals for Improvement”. En M. Gascó-Hernandez & T. Torres-Coronas (eds. ), Information Communication Technologies and City Marketing: Digital Opportunities for Cities Around the World, 26-49. Hershey: PA IGI Global. Fernández-Cavia, J., Marchiori, E., Haven-Tang, C., & Cantoni, L. (2017): “Online communication in Spanish destination marketing organizations The view of practitioners”. Journal of Vacation Marketing, 23 (3), 264-273. http://dx.doi.org/10.1177/1356766716640840. Fernández-Cavia, J., Rovira, C., Díaz-Luque, P., & Cavaller, V. (2014): “Web Quality Index (WQI) for official tourist destination websites. Proposal for an assessment System”. Tourism Management Perspectives, 9, 5-13. http://dx.doi.org/10.1016/j.tmp.2013.10.003. Gallego-Álvarez, I., Rodríguez-Domínguez, L., & García-Sánchez, I. M. (2010): “Are determining factors of municipal E-government common to a worldwide municipal view? An intra-country comparison”. Government Information Quarterly, 27, 423-430. http://dx.doi.org/10.1016/j.giq.2009.12.011. Gandía, J. L., & Archidona, M. C. (2008): “Determinants of web site information by Spanish city councils”. Online Information Review, 32 (1), 35-57. http://dx.doi.org/10.1108/14684520810865976. Gaule, E., & Zilinskas, G. (2013): “E-governance in Lithuanian Municipalities: External Factors Analysis of the Websites Development”. Public Policy and Administration, 12 (1), 80-93. http://dx.doi.org/10.5755/j01.ppaa.12.1.3854. Hair, J. F., Black, W. C., Babin, B. J., & Anderson, R. E. (2010): Multivariate data analysis (Seventh Edition). Upper Saddle River, New Jersey: Pearson Prentice Hall. Hayes, A. F., & Krippendorff, K. (2007): “Answering the call for a standard reliability measure for coding data”. Communication methods and measures, 1 (1), 77-89. http://dx.doi.org/10.1080/19312450709336664. Hernández-Mogollón, J. M., Campón-Cerro, A. M., & Alves, H. M. (2011): “The state of the art in research into rural tourism in Spain: an analysis from the perspective of marketing”. Enlightening Tourism. A Pathmaking Journal, 1, 31-61. Herring, S. C. (2010): “Web Content Analysis: Expanding the Paradigm”. En J. Hunsinger, L. Klastrup & M. M. Allen (eds. ), International Handbook of Internet Research, 233-249. Springer Netherlands. Huang, Z. (2006): “E-Government practices at local levels: an analysis of U.S. counties´ websites”. Issues in Information Systems, 7 (2), 165-170. Ibáñez, R., & Rodríguez-Villalobos, I. (2012): “Tipologías y antecedentes de la actividad turística: turismo tradicional y turismo alternativo”. En A. Ivanova & R. Ibáñez (eds. ), Medio ambiente y política turística en México. Tomo I: Ecología, biodiversidad y desarrollo turístico, 17-33. México D.F. : Secretaría de Medio Ambiente y Recursos Naturales, Instituto Nacional de Ecología. Igartua, J. J. (2006): Métodos cuantitativos de investigación en comunicación. Barcelona: Editorial Bosch. Jack, G., & Phipps, A. (2005): Tourism and Intercultural Exchange. Why Tourism Matters. Clevedon: Channel View Publications. Jiménez-Morales, M., & de San Eugenio, J. (2009): “Identidad territorial y promoción turística: la organización de eventos como estrategia de creación, consolidación y difusión de la imagen de marca de un territorio”. Zer, Revista de Estudios de Comunicación, 14 (26), 277-297. Karlsson, M. (2012): “Charting the liquidity of online news: Moving towards a method for content analysis of online news”. International Communication Gazette, 74 (4), 385-402. http://dx.doi.org/10.1177/1748048512439823. Kautsky, R., & Widholm, A. (2008): “Online Methodology: Analysing News Flows of Online Journalism”. Westminster Papers in Communication and Culture, 5 (2), 81-97. http://dx.doi.org/10.16997/wpcc.69. Keith, S., Schwalbe, C. B., & Silcock, B. W. (2010): “Comparing war images across media platforms: methodological challenges for content analysis”. Media, War & Conflict, 3 (1), 87-98. http://dx.doi.org/10.1177/1750635210353676. McMillan, S. J. (2000): “The microscope and the moving target: the Challenge of applying content analysis to the World Wide Web”. Journalism and Mass Communication Quarterly, 77 (1), 80-98. http://dx.doi.org/10.1177/107769900007700107. Míguez-González, M. I., & Fernández-Cavia, J. (2015): “Tourism and online communication: interactivity and social web in official destination websites”. Communication & Society, 28 (4), 17-31. http://dx.doi.org/10.15581/003.28.4.17-31. Moon, M. J., & Norris, D. F. (2005): “Does managerial orientation matter? The adoption of reinventing government and e‐government at the municipal level”. Information Systems Journal, 15 (1), 43-60. http://dx.doi.org/10.1111/j.1365-2575.2005.00185.x. Moragas, M. de (2015): “Cruce de caminos. Tecnologías de la comunicación y convivencia en la ciudad global”. Revista TELOS. Cuadernos de Comunicación e Innovación, 100, 78-80. Morgan, N., & Huertas, A. (2011): “Advancing the study of place brands, tourism and reputation management”. Catalan Journal of Communication & Cultural Studies, 3 (2), 149-158. http://dx.doi.org/10.1386/cjcs.3.2.149_2. Neuendorf, K. A. (2002): The content analysis guidebook. Thousand Oaks, California: Sage Publications. Organisation for Economic Co-operation and Development (2016): OECD Tourism Trends and Policies 2016. Highlights. Paris: OECD Publishing. Piñeiro-Naval, V., & Igartua, J. J. (2012): “La difusión del patrimonio a través de Internet. El caso de Castilla y León”. Cuadernos de Turismo, 30, 191-217. Piñeiro-Naval, V., & Igartua, J. J. (2013): “El análisis formal de sitios web y su papel en la promoción del e-turismo”. Comunicación. Revista Internacional de Comunicación Audiovisual, Publicidad y Estudios Culturales, 1 (11), 82-98. Piñeiro-Naval, V., Igartua, J. J., & Marañón, F. (2017): “El diseño de las sedes web municipales de España. Una propuesta metodológica para su análisis”. Revista Española de Documentación Científica, 40 (1), e164. http://dx.doi.org/10.3989/redc.2017.1.1368. Piñeiro-Naval, V., Igartua, J. J., & Rodríguez-de-Dios, I. (2015): “La información turística a escala local. Un análisis de contenido de los portales web municipales de España”. Revista TELOS. Cuadernos de Comunicación e Innovación, 102, 77-87. Piñeiro-Naval, V., Igartua, J. J., & Sánchez-Nuevo, L. A. (2017): “Identificación de factores externos que predicen el estado de los sitios web municipales: una aproximación regional al caso de España”. Observatorio (OBS*) Journal, 11 (3), 44-60. http://dx.doi.org/10.15847/obsOBS11320171041. Richards, G. (2016): “El turismo y la ciudad: ¿hacia nuevos modelos?”. Revista CIDOB d’Afers Internacionals, 113, 71-87. Riffe, D., Lacy, S., & Fico, F. (2014): Analyzing Media Messages. Using Quantitative Content Analysis in Research (3rd ed.). New York: Routledge. Robinson, J. P., Shaver, P. R., & Wrightsman, L. S. (1991): “Criteria for scale selection and Evaluation”. En J. P.
Robinson, P. R. Shaver & L. S. Wrightsman (eds. ), Measures of personality and social psychological attitudes, 1-16. San Diego: Academic Press. Rufín, R., Medina, C., & Sánchez-Figueroa, J. C. (2012): “Moderating Factors in Adopting Local e-Government in Spain”. Local Government Studies, 38 (3), 367-385. http://dx.doi.org/10.1080/03003930.2011.636035. Shipley, R., & Snyder, M. (2013): “The role of heritage conservation districts in achieving community economic development goals”. International Journal of Heritage Studies, 19 (3), 304-321. http://dx.doi.org/10.1080/13527258.2012.660886. Šifta, M. (2016): “Graphic symbols and local identity: the case of use and perception of municipal emblems in the Liberec Region (Czechia)”. Geografisk Tidsskrift-Danish Journal of Geography, 116 (2), 147-158. http://dx.doi.org/10.1080/00167223.2016.1188021. Sjøvaag, H., & Stavelin, E. (2012): “Web media and the quantitative content analysis: Methodological challenges in measuring online news content”. Convergence: The International Journal of Research into New Media Technologies, 18 (2), 215-229. http://dx.doi.org/10.1177/1354856511429641. Standing, C., Tang-Taye, J. P., & Boyer, M. (2014): “The Impact of the Internet in Travel and Tourism: A Research Review 2001-2010”. Journal of Travel & Tourism Marketing, 31 (1), 82-113. http://dx.doi.org/10.1080/10548408.2014.861724. Túñez-López, M., Altamirano, V., & Valarezo, K. P. (2016): “Comunicación turística colaborativa 2.0: promoción, difusión e interactividad en las webs gubernamentales de Iberoamérica”. Revista Latina de Comunicación Social, 71, 249-271. http://dx.doi.org/10.4185/RLCS-2016-1094. Urry, J., & Larsen, J. (2011): The Tourist Gaze 3.0. London: SAGE Publications Ltd.
Weare, C., & Lin, W. Y. (2000): “Content analysis of the World Wide Web. Opportunities and challenges”. Social Science Computer Review, 18 (3), 272-292. http://doi.org/10.1177/089443930001800304. Weber, R. P. (1994): “Basic content analysis”. En M. S. Lewis-Beck (ed. ), Research Practice. International Handbooks of Quantitative Applications in the Social Sciences, vol. 6, 251-338. Singapore: Sage Publications & Toppan Publishing. World Tourism Organization (2017): UNWTO Annual Report 2016. Madrid: UNWTO. World Travel & Tourism Council (2017): Travel & Tourism Global Economic Impact & Issues 2017. London: WTTC. Yang, X. (2016): “Industrial heritage tourism development and city image reconstruction in Chinese traditional industrial cities: a web content analysis”. Journal of Heritage Tourism, 12 (3), 267-280. http://dx.doi.org/10.1080/1743873X.2016.1236800. Article received on 2 September 2017. Accepted on 26 November.